As a global bucket-list destination, Cape Town attracts tens of thousands of people to its world-famous attractions such as Table Mountain, the Constantia winelands and its pristine beaches. But no visitor to the Mother City should miss out on its beautiful historic buildings, museums and diverse history. See everything the Cape Town inner city has to offer with our Historic City free walking tour. The Historic City Walk departs daily at 10.30am, 12pm, 1.30pm, 3pm and 4pm from our Long Street ticket office (stop 5). As you explore the city in the 90-minute tour, your guide will highlight buildings and places of relevance and history along the route. 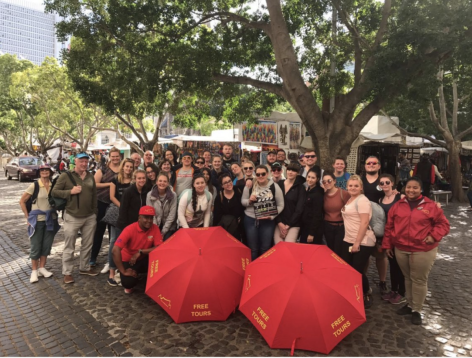 Look out for the tour guide in their red uniforms with their red umbrellas to join the City Sightseeing Free Walking Tours. We recommend that guests first enjoy the full tour and soak up the history and stories from the guide and thereafter return to visit the museums and attractions on the route. 81 Long Street (stop 5) is home to one of our ticket offices, where you can buy tickets for all our red bus tours and cruises. This all-stop shop is home to one of our ticket offices, where you can buy tickets for all our red bus tours and cruises. You can also enjoy a cup of coffee and a snack at the in-house café and visit our Travel Depot, an information and booking hub showcasing the best travel experiences the Cape has to offer, as well as local products and designs. The City Sightseeing Free Walking Tours start here, look out for the tour guide in their red uniforms with their red umbrellas. St George’s Cathedral is the oldest and one of the grandest cathedrals in Southern Africa. (Image: City Sightseeing) St George’s Cathedral is the oldest and one of the grandest cathedrals in Southern Africa and the mother church of the Anglican Diocese of Cape Town. Affectionately known as “the People’s Cathedral” for its role in the struggle against apartheid, the church kept its doors open to people of all races throughout the apartheid era. Here, after Archbishop Desmond Tutu led a mass demonstration of 30 000 people in 1989, he coined the term the “rainbow nation” to describe South Africa’s diverse population. Learn more about the cathedral’s interesting history – for example, the foundation stone was laid in 1901 by the future King George V and can be seen from the bottom of Government Avenue leading into the Company’s Garden. Visit the Planetarium adjoining the South African Museum for an enriched experience.Step back into history and see more than 1.5-million items of cultural and scientific importance at the South African Museum. The museum houses a wide range – from specimens and fossils dating back over 700-million years to contemporary T-shirts. Also visit the Planetarium adjoining the museum to learn more about the planets and stars with a virtual exhibition. The South African Jewish Museum offers engaging accounts of South African Jewish history. The South African Jewish Museum is a moving tribute to and detailed account of one of the great Jewish communities of the diaspora. The building offers visitors a poignant and moving experience with bold architectural design, interactive multimedia displays and engaging accounts of South African Jewish history. The late former President Nelson Mandela officially opened the museum in December 2000, and you can watch the award-winning documentary Nelson Mandela: A Righteous Man screened daily. The venue also has exhibitions, including works by celebrated South African artists such as Irma Stern and William Kentridge, and by Marc Chagall. Explore the District Six Museum by yourself, or choose to be guided by a former resident. In 1966, the South African government of the time swooped on District Six as part of its efforts to enforce apartheid, forcibly removing its occupants and declaring the area a “whites-only” zone. Decades later, the District Six Museum is a reminder of these tragic events, but also a symbol of return and restitution to former residents and the people affected. See an impressive collection of historical photographs, paintings, artefacts, physical remains such as street signs, books and studies, as well as audio-visual recordings from District Six, most of which were donated by former residents. Either explore the museum by yourself, or choose to be guided by a former resident. We recommend the latter to enrich your experience at this heritage site. The Castle of Good Hope was built between 1666 and 1679 by Dutch administrator Jan van Riebeeck of the Dutch East India Company. The oldest surviving colonial building in South Africa, the Castle of Good Hope is located in the heart of Cape Town, opposite the Grand Parade and near the magnificent City Hall. The Castle of Good Hope was built between 1666 and 1679 by Dutch administrator Jan van Riebeeck of the Dutch East India Company, mainly as a defensive fort. In its long history, it has served as military stronghold, prison and now museum, heritage site and public gathering space. Wander the grounds on your own or join a guided tour to learn more about how the castle was built, its history and its former occupants.